JS: In some fragment, the Greek philosopher Heraclitus says that time is a child playing a game-- time is the child's kingdom. I've always wondered what he meant. 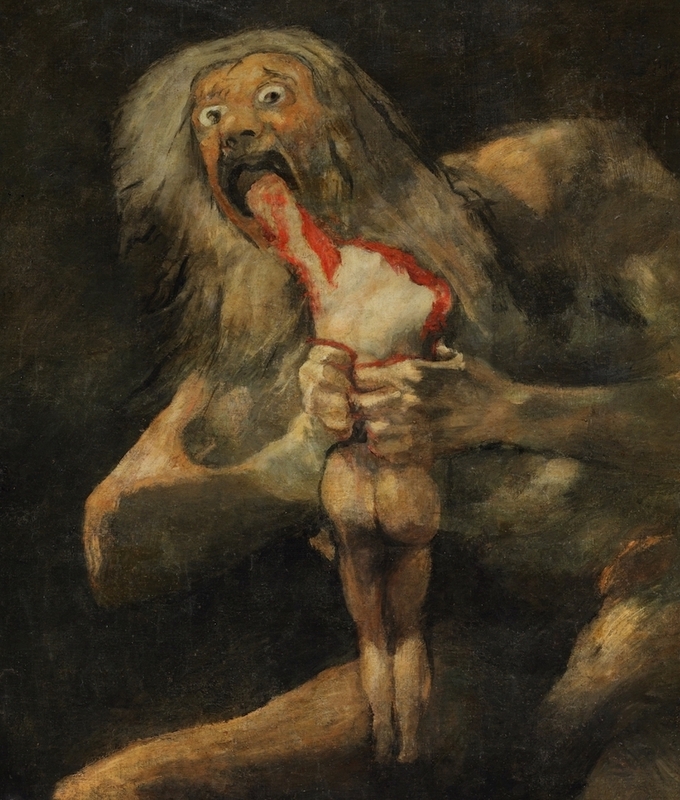 Chronos makes us the playthings of time and ultimately the snack-treats of time, as Time devours us. How to turn the tables on Time? How to make time our play-thing? Science fiction would say: build a time machine. A cosmologist might say: find a black hole and an event horizon. Go in. JG: I think with your comparison of science fiction and the cosmologist you’ve perhaps hit a very important point about Time; there are many ways to view Time and choosing how we view Time is the first hurdle we have to overcome if we are to turn the tables on Time. I think the most useful perspective of Time is one from Ancient Greece, this idea of Chronos and Kairos. Chronos is physical time, the one Einstein and Newton were concerned with, whereas Kairos is best translated as a ‘supreme moment’ or ‘decisive moment’. Perhaps a good analogy for these two things is a football match; the 90 minutes is symbolic of Chronos, whereas the goals scored are the Kairos of the match, the moments that will be remembered. However, I think it’s important to recognise that Chronos is finite, whereas Kairos is infinite. I return to the example of a football match; the match lasts 90 minutes, but you could theoretically score an infinite amount of goals in this time. Perhaps this means that Chronos is a derivative of Kairos; that Chronos is made in the image of Kairos, in the same sense that humans are made in the image of God. This raises an interesting question: given that humans have developed vastly different conceptions of deities over our history and that Kairos, in the sense that it is metaphysical, exists on the same level as the gods, is it not impossible to define Kairos? And if we are able to define Kairos, wouldn’t it be impossible to make Time our play-thing, if we are still subject to Kairos after transcending Chronos? JS: Let's move beyond the football analogy and discuss your very intriguing suggestion that ‘Chronos is a derivative of Kairos; that Chronos is made in the image of Kairos, in the same sense that humans are made in the image of God.' I think of Jesus on the cross as a perfect overlapping of Chronos and Kairos, the incarnation unfolding as it had to in real time so that Jesus can ascend to God after three days. Perhaps the genius of Christianity is in giving people the sense that chronological time has a sacred dimension, a timeless one, that everyone can ascend to if they live with Jesus in their hearts as pious Christians. What could be more splendid? What could be more attractive to people mired in the misery of Chronos while under the heel of the merciless Romans? Jesus was Kairos incarnated as Chronos so he could work out our salvation. Made weak, that is, by chronological time. Ulysses tries to work himself up to a fever pitch in order to run off and pursue a few more moments of Kairos but a great weariness suffuses this poem, a twilight-of-the-idols sense of belatedness. And we postmoderns are yet more belated. Is Kairos dead for us? Without a sacred dimension, are we condemned to Chronos? JG: Your suggestion that Jesus is ‘Kairos incarnated in Chronos’ is very interesting, because if humans are created in the image of God, then perhaps all humans are, in a sense, Kairos incarnated in Chronos. Perhaps we postmoderns are so belated because we refuse to recognise this fact about ourselves, and that our role, in a sense, is to produce moments of Kairos. Perhaps this is Nietzsche’s subliminal message when he had the madman proclaim, ‘God is dead!’—that the death of metaphysics would lead to the end of this pursuit, and this would leave us drowning in a sea of nihilism. However, this doesn’t account for the continuation and proliferation of the arts that we have seen in the past 100 years; there is still clearly a drive to create moments of Kairos. Perhaps this suggests that Kairos isn’t dead, but rather it’s been driven down into our collective unconscious, waiting to be rediscovered. The question is how? JS: I think that’s a telling way of thinking of our era, or epoch: a time without Kairos. Most people have no sense of time other than as Chronos: from womb to tomb, as Beckett says. The arts may have proliferated but largely in the absence of an experience of the sacred that tends to lend gravitas—if not fecund levitas—to its productions. I am fairly certain that much of contemporary art—the installation art that often carries away The Turner Prize—has not much Kairos enlivening it. At any rate, for most people—my hoary self included—life is just one damn thing after another. And those things are increasingly heavy and need boxing up and moving every five or ten years. In the words of the great Gustav Mahler, ‘life has been mostly paperwork.’ We now might say pixel-work but the point is Kairos is nowhere in sight. How have we become so lazy about creating moments of Kairos? Is ‘the holiday’ really the last vestige of Kairos? Is it really possible to get beyond nihilism if you are a drone in a machine, albatrossed with a mortgage and with getting the children into a good grammar school? To put it bluntly: who has time for Kairos? JG: I think you’ve hit on a major problem with our society; over the past 60 years, our world has become more interconnected, especially with the proliferation of the Internet. As a result, we have been reduced to being ‘drones in a machine’, doing our part to keep the edifice of humanity from collapsing under its own weight. When there are billions of people doing the same, your role seems insignificant, perhaps meaningless. Even holidays have lost their sense of Kairos; Thomas Cook can wizz you and your family off to the Canaries with just a swipe of your credit card. In our postmodern world, we can access anything at any time, and perhaps we cannot cope with all the information we are receiving. We shut down and choose the path of least resistance, letting Chronos do all the work for us. Perhaps there is also the question of whether people are able to understand how to create moments of Kairos. In our postmodern world, we tell people that they can do and be anything they want, and that there is no canonical way of interpreting things. Perhaps this mentality flummoxes people and causes them to lose their creative instinct, for most people need to have a structure in order to create. Therefore, in a sense, we don’t know how to create moments of Kairos anymore. Perhaps it’s not a question of who has time for Kairos; it’s instead a question of how esoteric is Kairos nowadays; is it undecipherable to us? JS: Indeed, the great democratising of, well, everything is both cause and effect of the Internet, which tends to level down and gives us information at such an exhausting rate that we may well have no appetite, or aptitude, for Kairos. As you suggest, we might not recognize Kairos if it came up and grabbed us by the lapels (most people no longer even have lapels!). Do you have any final thoughts about how to stimulate the urge for Kairos, or is that like leading the horse to water and crushing its head down until it drinks? JG: In a sense, the urge for Kairos is an urge to create, and an instinctive urge at that. In our time, this urge is repressed because many of us are increasingly dogmatic and ideological, in part as a response to our deep-seated nihilism, and also as a response to the sheer amount of information that we are exposed to as a result of the Internet. There are a range of possible solutions; perhaps we need to limit our use of the Internet and consequently the amount of information we receive. After all, many of the greatest creations arise from a seemingly simple insight, whether it be a melody, a line, or religious idea; and perhaps limiting our flow of information may cause us to make more out of the information that we receive. Another solution could be to rid ourselves of the dogmas that plague us, particularly the political ones; because dogmatic thinking only serves to limit the ideas that could provide a creative spark. However, we must also remember that the act of creation is a task best done by individuals or at most a small ensemble of individuals. Whether it’s music, movies, or a painting, the greatest works are often, if not executed by, certainly the vision of one person, who has taken on the divine responsibility of bringing a new object into being. In our age, with people being so willing to abdicate their responsibility for hedonistic pursuits, perhaps reviving the urge for Kairos is a mammoth task. In our time, could there be such a person, or group, that is capable of doing this? JS: I think art and artists are nearly alone in producing moments of Kairos. It’s all well and good that Odysseus strings his bow and murders all the suitors but what we really remember is Homer’s poetry, not the bloodlust of an egomaniacal trickster. Art purveys Kairos and Life is mired in Chronos. Maybe Jesus was a kind of work of art, but he lives on not because he walked on water or healed lepers. He lives because the gospel writers forced time into Kairos by giving it significant form. But killing off religions and God and older forms of Kairos does indeed, as you suggest, make us responsible for shaping time into something that transcends Chronos. Before it’s too late. Even our modest dialogue has attempted that feat. And we did it on time.